Universal high performance engine oil based on selected base oils and modern additives. Ensures optimum lubrication even under extreme conditions. Also provides reliable wear protection. € 39,95 Inc. tax, ex. shipping. Universal high performance engine oil based on selected base oils and modern additives. Ensures optimum lubrication even under extreme conditions. Also provides reliable wear protection. Its high level of corrosion protection ensures reliable protection against rust and corrosion. 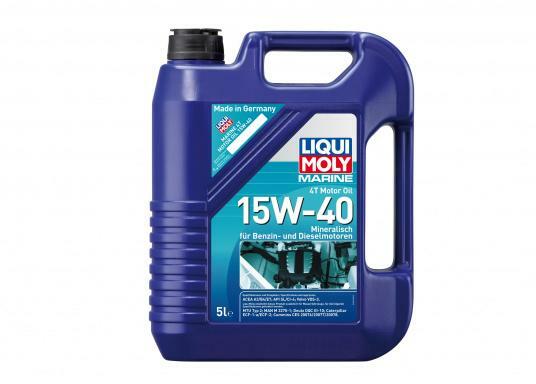 Application area: Year-round oil for petrol and diesel boat engines. Can be mixed with all commercially available engine oils. Bevat (naam van de sensibiliserende stof). Kan een allergische reactie veroorzaken. cette huile est elle VDS3 comme préconisé par Volvo ? Merci ! Bonjour Monsieur, D'après le fabricant de cette huile, celle-ci respecte bien les standards VDS3. ...ist halt Motoröl. Kanister mit praktischer Ausgießtülle (bitte vor Gebrauch herausziehen).